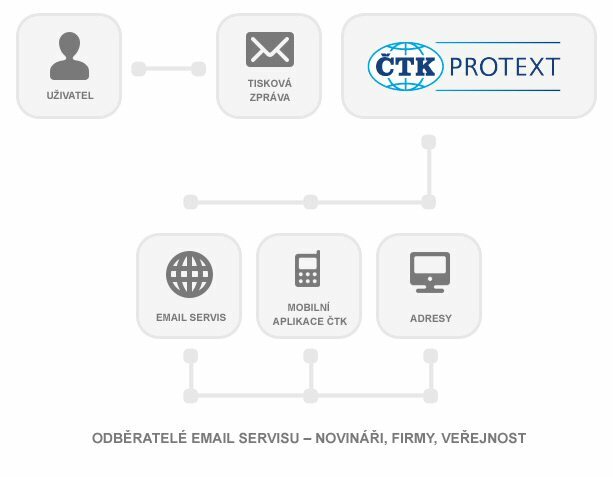 The Protext Online offers companies and individuals publication of a press release on the protext.cz portal and its distribution by e-mail. It is a cost-effective communication strategy tool for your PR presentation. The press release will be received by up to 5000 subscribers of the free e-mail service, who are mainly journalists, representatives of companies and public. The texts will be included in CTK news applications for smart phones and, for a certain period, are also available on www.ctk.cz website. Thanks to the news portals subscribing to Protext news, information will reach also other readers. The Protext Online may be used to inform about your new products and services, changes in the company, organized events; this is also the way to respond to media reports, etc. The Protext Online connects press release submitters, media, companies and the experts. You can quickly, easily and effectively approach a large number of readers through this service. The e-mail service is now used by more than 5000 subscribers. We guarantee publication of the press release within 4 hours of its submission. We will attach, free of charge, a photo or a company logo to the text on the website. The press releases are thematically categorized, so they can get to those readers who are really interested in them. The published press releases are archived, so that the readers may access them permanently. The texts are included in CTK news applications for smart phones. For a list of subscribers of a selected category contact us at protext@ctk.cz.